Nigerian music star, Davido is unarguably one of the biggest music exports of Africa on the global scene. With uncountable chart-topping hit songs to his name and several accolades in his name, he has made a name for himself beyond the shores of Africa. "I'm the only African person in that neighbourhood so I moved in and two days later, detectives came to my door. They came in and searched the whole house asking me what I do because I bought that house cash. I don't have a problem with authorities but it might be shocking," he said. "I won't say it is racism, that's how they've been brainwashed. Living in America, you are brought up to think that Africa is a no-go area. In Africa, we are brought up to think that these people took everything from us so that is something that we have to fix." "I might probably go into politics. If I'm not in it 100%, I might just be around. There's a lot of things going home that's not right. If I was in that position, there's a lot of things I'll do differently. "Being African is cool now. It's not only music, there's the clothes, food and the whole culture. "I have the biggest record ever in America right now, an African record. Most of the record is broken English, I'm speaking in broken English they don't even know what I'm saying but it feels good." 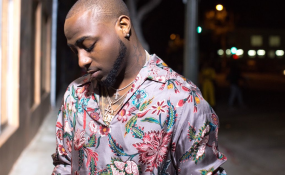 It would be recalled that there were recent reports that Davido sold out the 20,000 capacity O2 Arena, a feat first achieved by Wizkid although some news outlet like Soundcity has refuted the claims saying Davido only had 17,000 concert-goers and didn't sell out the arena.